It was Boxing Day 2012. After an early start my friend Rosa and I jumped on a plane to Invercargill. The alternative was an eight hour drive, so the decision to fly was an easy one. From there we had the option of catching a ferry from Bluff across the notoriously rough Foveaux Strait, or another short flight. The plane ride won again, as the alternative would have involved finding transport from the airport to Bluff and a possibly rough two hour ferry ride. We squeezed our bulging packs on board the tiny plane and flew over to the Island, landing on a grass strip. A minibus collected us from the ‘airport’ and dropped us off in the centre of town. Stewart Island – Rakiura, is the Southernmost inhabited Island in New Zealand. Just 500 people live here, all in the main town of Oban which overlooks Halfmoon Bay. We had booked a bach (holiday house) with our friends Nick & Amy who were due to arrive the following day. Sadly we still haven’t learnt how to travel light, so we started dragging all our gear up the steep hill to the house before one of the friendly locals stopped and picked us up and dropped us at the door. We made ourselves at home and met another friendly neighbour who tapped on the window to introduce himself, asking for a nut or two. A friend of mine – Andy Gillies had sailed his yacht Riot, (a Young 88 like Wildwood) single handed down to Stewart Island. We tracked him down and headed out to see him on Riot, anchored in Golden Bay for a fabulous dinner of Blue Cod freshly caught that day. 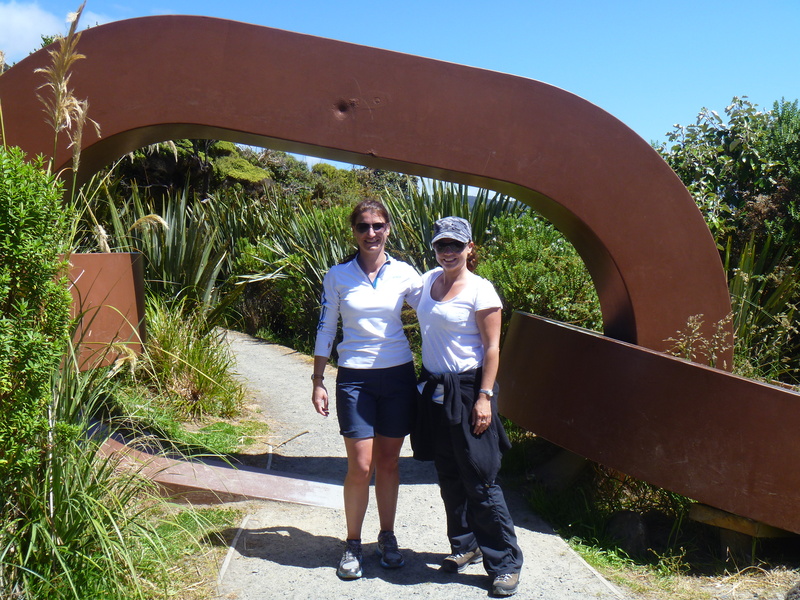 The following day we were due to start the Rakiura Track – one of New Zealand’s Great Walks. We had both spent a small fortune on purchasing new hiking boots, a jet boil, packs and other essential hiking gear. In fact I think I had spent enough to stay in a five star hotel for a week, but instead, here we were venturing out in to the unknown, sleeping in huts, battling the sandflies and lugging heavy packs. We had a hearty cooked breakfast and cups of coffee at the town’s only cafe before wandering along the street to the start of the track. Legend says that the South Island was a waka (canoe) in which Maui fished up the North Island. Stewart Island was the waka’s anchor, so the start of the track has a huge chain monument which signifies this anchor chain. The weather was stunning and so was the scenery. The first day is a leisurely 8km along the coast line. The white sandy beaches and crystal clear water was so inviting that we stripped off and ran as fast as we could down the beach and in to the sea to avoid being bitten by the ferocious sandflies. We arrived mid afternoon at Port William Hut and met some of our fellow trampers – a hiking group from Auckland. Port William Hut also has a campsite and a lovely aspect on a large grassy area overlooking a stunning beach. It seemed like a great excuse to celebrate and drink the bottle of bubbles Rosa had diligently carried all the way in. Needless to say we were pleased we had packed the earplugs, however we did not get a good sleep. Our hiking companions were up VERY early the next morning. We pulled our sleeping bags over our heads and tried to block out their incessant rustling of crispy plastic bags and waited for them all to leave before venturing out to brew up some coffee and pancakes in the fabulous jet boil. If it is possible to be in love with a cooking appliance, then I am having an affair with the Jet Boil. This piece of equipment was sold to me as the ‘must have’ piece of essential equipment any trendy tramper should have. It cost a small fortune, but the amount of comments and envious looks I have had from fellow hikers has made the expense so worth while. It boils water in just two minutes! This means you can have hot coffee and be cooking pancakes almost simultaneously. Everything then sexily packs back in to the cup to tuck away back in your pack. It is light, looks hot, and is just so well designed. Ah yes I LOVE that jet boil! After breakfast we were back on the track. Day two is much harder. 13km or six hours of up and down lots of hills through the forest all day. You never quite make it to a summit where you get the gratification of a view. There is one particularly steep section of lots and lots of stairs. We made it to the top and had some lunch and a wee snooze in the sun before carrying on. We had been walking for six hours, and thought we must just about be at the next hut, when – no – another up hill section! The track is pretty well formed, but quite muddy in places. We were pleased we had great weather! There are also interesting relics scattered throughout the bush, a throwback to the days when logging took place in the bush. Anyway we finally made it to North Arm Hut. Also located waterside on Paterson Inlet. The following day we had arranged to catch up with Andy on Riot again half way along the day three track, to go and explore some of the bays in Paterson Inlet. We called him up again on the hand held VHF and arranged the rendezvous at Kidney Fern Bay. The tide had gone out and the dinghy could only come so far and we paddled out over the mudflats. We visited Kaipipi Bay, site of a Norwegian whaling station from the 1920’s. Huge boat propellors and other relics from their boat repairs are littered on the beach. We then called back past Golden Bay and collected our friends Amy, Nick, Lily and Craig and headed over to the beautiful Ulva Island. Ulva is a predator free bird sanctuary and with the flowering rata trees, singing birds and stunning golden sandy beaches, it is a lovely place to spend a day. There are water taxis that take visitors over to the island if you don’t happen to have a friend there with one to ferry you around! If you sailed your yacht down here you could easily spend a week cruising just around Paterson Inlet. There are lots of lovely little bays to discover and great fishing as well. 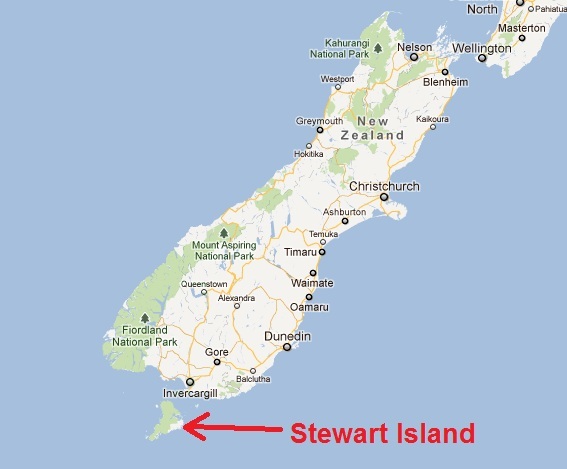 However there is lots more of Stewart Island to discover further south if you are cruising. Port Adventure and Port Pegasus are supposed to be stunning cruising grounds. Andy did head down there after we had gone home. On New Years Eve, my friend Naomi had arrived. Keen do to some fishing, Andy invited us back out on Riot to catch some blue cod. The fish had the right idea and had gone in to hiding, probably just as we should have! As we were anchored up for lunch in Glory Bay, the wind changed and built to a strong gale. No problem we thought. We put two reefs in the main, hoisted the storm jib and poked our nose out of the bay to head back towards Golden Bay. The wind really piped up now. Surprisingly I was quite enjoying the ride – most likely because I was on someone elses boat and not having to make any decisions. We were unable to make any headway and were continually getting knocked downwind and closer to the rocky shoreline. After the dinghy had flipped for the 3rd time, we decided to start the motor to see if we could make any headway with its assistance. We got knocked down again and the motor got a big gulp of air and stopped. OK time to head back to where we had come from. We had difficulty anchoring. By this time it was absolutely pouring with rain, and the anchor wouldn’t set. We kept pulling up anchorfuls of weed from the bottom. All three of us were absolutely drenched. Finally Andy managed to row ashore to put some lines out which helped hold us in place. It was getting late, and we knew Rosa, Amy, Nick & Craig were waiting for us back at the bach with bottles of champagne, crayfish and paua to welcome in the New Year. There is no cellphone reception, and we knew they would be worried with the weather the way it was. While we were fine, we didn’t want them to go and raise the alarm and send anyone out in the terrible weather to look for us. So we made a call on the VHF radio to the local shore based radio station. They then phoned the pub who called the house next door to the holiday house, and they went next door to tell our friends that we were all ok! Phew we could now relax and try to dry out. Andy made pizzas for dinner and we managed to drink all his alcohol and we had a very merry, if somewhat different, New Years celebration to the one we had planned! I strangely slept really well all night with the storm raging, while Naomi and Andy were up and down all night checking the anchor. The next day the sun came out and we headed back to dry land. 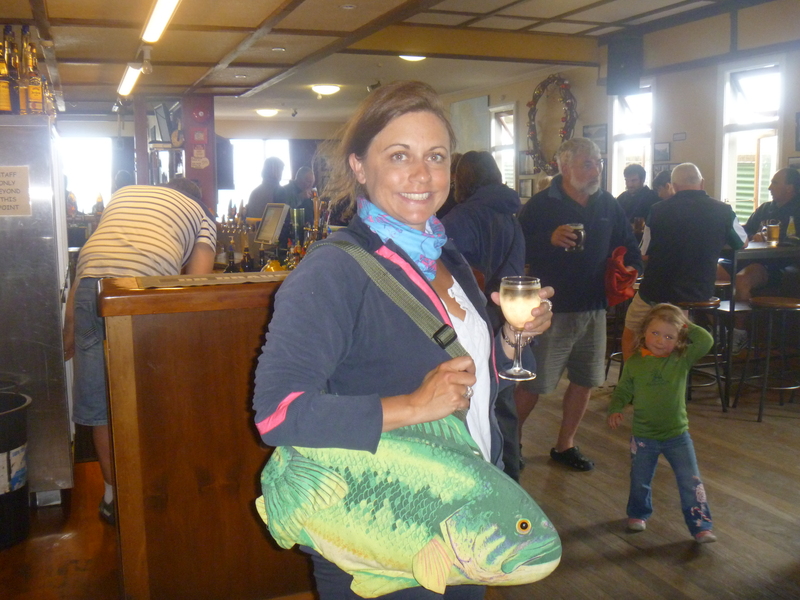 I found a fantastic fish bag in the bach we were staying at and I decided to take it out to the pub for their legendary quiz night. I got lots of comments, and was sad to have to leave the fish bag behind back at the house, although I am not sure it would be quite so trendy in any other town. It is a great pub, and you feel more than comfortable in either gumboots or socks and jandals. After a week on Stewart Island it had captivated me. This is a really special place. I will be back on my own boat someday to explore the uninhabited Ports further South. But even if you don’t have a boat, there are plenty of other adventures to be had, including the 10 day hike around the top half of the island. This is for the more serious hiker, and you have got options for being dropped off at various points by plane or boat. If you do sail down, be sure to get your hands on a copy of the Stewart Island Cruising Guide which has a wealth of information about all the good places to go and visit. Bring your camera, walking boots, your insect repellant, a Jet Boil and don’t forget to go along to the pub quiz! 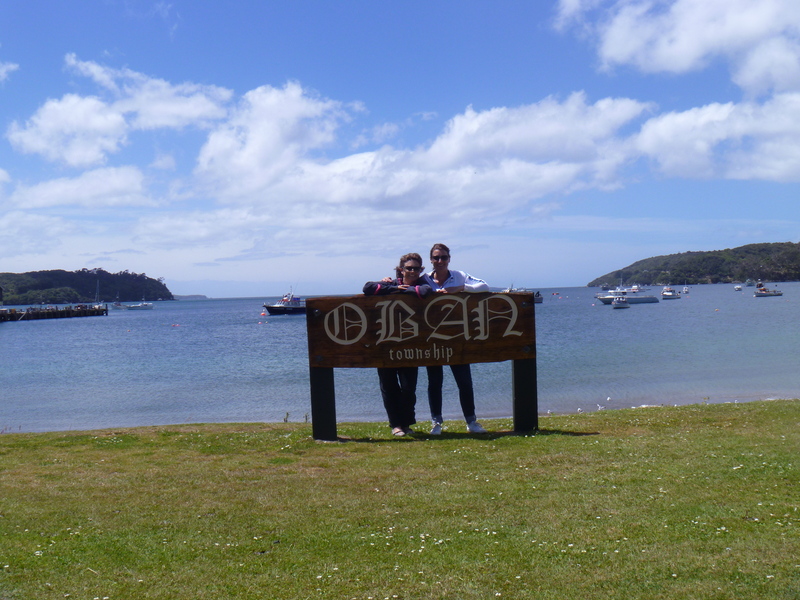 Stumbled across your blog and we had a laugh to ourselves … we were out on our boat at the same time at Stewart Island and remember very well that yacht trying to anchor in the stormy seas! Must have been Andy who shouted out ‘you’d have to be mad to be a yachtsman!’ … and from the sanctity of our 55 foot vessel we had to agree! Wow what a coincidence! That definitely sounds like something Andy would say! Had it been my boat I’m sure I’d have been having a complete meltdown, but on someone else’s it was a great adventure! Stunning place though despite the weather. Did you get down to Port Adventure and Port Pegasus? I’d love to get back there and do some more exploring. I’d definitely say that was a coincidence! We went to Port Adventure, but due to the continuing bad weather cut our stay short so we could get back for work in Dunedin for early January. There are so many beautiful places to explore at Stewart Island. looks like a simply beautiful spot! I didnt know that much about this island. It is worth a visit when you are in this part of the world! Lily looks thrilled with the occasion! Such a great holiday…have to take Isla for a visit since this trip inspired her name!